Large Tarot Bags - Pharaohs Large Tarot Bag - Tarot Bags, Tarot Cards, Cloths, & More! Many decks would coordinate with this bag. Some of those include three Lo Scarabeo decks - Tarots of the Sphynx, Egyptian Tarot, and Ramses, Tarot of Eternity - and an AGM Mueller deck, Ibis Tarot. 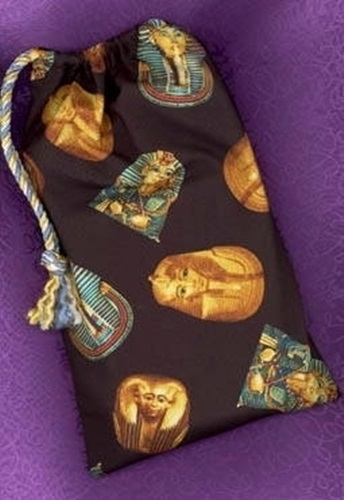 Another deck that is a perfect color/theme coordination is Clive Barrett's Ancient Egyptian Tarot. If you own the Tarot of the Ages, you'll find it to be an excellent match too. 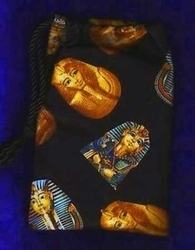 There are many Goddess and world cultures decks that would match wonderfully with this bag. Those are too numerous to list here, but look within your decks for ancient Egyptian Gods and Goddesses and you will likely find more than a few. Size: Large, 6 x 10 inches. 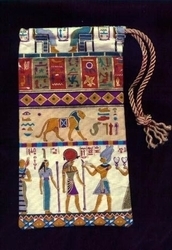 The beauty of this size of bag is that it will hold two decks at once or some combinations of deck, small book, spreadcloth. Try different combinations of items until you find the mix that pleases you the most.